A Public Address (PA) system is a collection of audio equipment that allows broadcasts over a designated area. Often found in schools and office buildings, PA systems can be used for general announcements or emergency information, providing a simple way to get information out quickly. PA systems can be basic or advanced, and people can customize them to fit a variety of needs. There are even personal models that can be less expensive, but allow for a much shorter range. Basic PA Systems are comprised of loudspeakers placed in convenient locations around a broadcasting area, an amplifier to increase the sound, and a mixer that adjusts audio levels. The user speaks into a microphone, and the sound is transmitted through connected cables, or a wireless system, out through the speakers. Some systems also include microphones or intercoms near the speaker locations, allowing the listener to reply to the central location. These responses are not broadcast to the entire system, however, but only to the main user area. In order to meet the huge market demands, we are involved in offering the best quality of PA System. 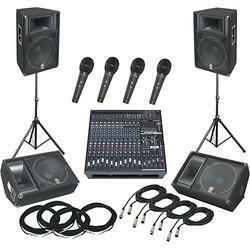 This PA System is known for its supreme quality and high durability. The customers can avail this PA System from us in various sizes and dimensions. The high performances of PA System are increasing its demands in the market. Customers can avail this from us at market leading rates. Looking for PA System ?